"When the Klein family sold off a little bit of their land to that first developer, they had no idea what they were starting. People with money dream of a nice place in the country; the small nearby military installation doesn't have sufficient housing for personnel with children; and the nearby city's schools are straining at the seams. So people have rushed to make the country their home - but how long can it stay "the country" with so many children growing up in it? It's still a pretty one-horse town as far as the local teens are concerned. Can the citizens of the new township of Meadow Creek expand its infrastructure to meet the demands placed on it, without losing the fresh air and friendly small town vibe?" "Is it possible to retreat from the hurly-burly of the city to the peaceful countryside without dragging the hurly-burly along with you? Mountain Creek was a peaceful stream, frequented mostly by cows, until that first country retreat went up. And then the next. And the next. And it was such a pain going all the way into town when you needed to buy something, no one minded when someone opened a store right across the creek...Now the farmers have sold out, the developers have noticed - where will it all end? Will Meadow Creek remain a peaceful backwater, or become a bustling municipality, or even a wretched hive of scum and villainy?" However, if you don't have Pets or a later EP/SP installed, you can temporarily remove Bluewater Village (B001) from the NeighborhoodTemplate folder and move this subhood in there. It will still be referred as Bluewater Village in the game. But the game will add Meadow Creek to your neighborhood. Restore B001 after adding the subhood and you're done. This is a game bug and is not related to Meadow Creek. Affected is one sim -- Sirius Stahrr! This bug can be fixed with mods such as SimBlender or InSimenator (Reproductive Adjustor). Alternatively, it can also be fixed in SimPE. 2. Select your neighborhood then click "Open"
3. In the â€œResource Treeâ€� scroll until you see the Neighborhood memory record, click it in the resource list, then from the Plugin View choose the Stahrr family. 5. There, scroll until you see "Controller - Pregnancy"
6. Click on it and go to "RawData"
8. Commit your changes and save. Meadow Creek uses the SC4 terrain of EA's Garden Heights map. There's no need for a camera mod. You will see all of the lots in a vanilla game. We have 9 families in this neighborhood. Some of them are easy to play and some are a bit challenging. You can read more about them in the comments. 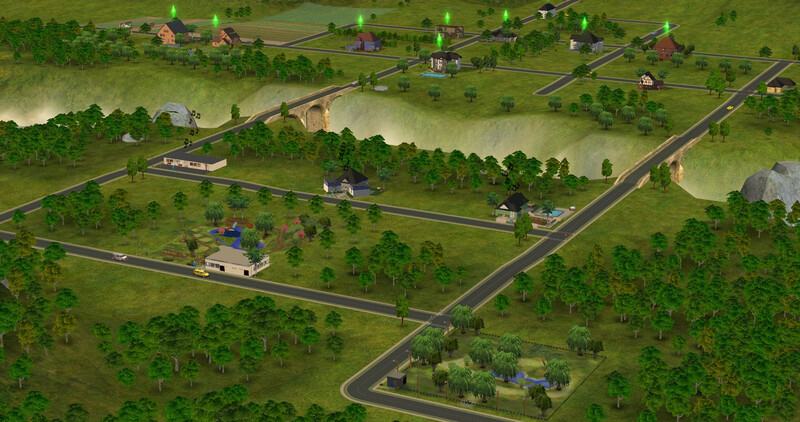 This neighborhood has been created with Numenor's AnyGameStarter with no Maxis content, so there aren't any townies. You have to generate them yourself if you want them. We have built a cemetary lot for this neighborhood so you can move your urnstones to the cemetary. You need Nightlife for this. If you don't have Nightlife but later EPs. Then you can put the urnstone into the inventory of any sim and visit the cemetary lot with that sim. Then you can click on the ground and choose the option to place the tombstone. You can read more about that lot in the comments for this thread. There are 4 vacant lots in the inhabited version of Meadow Creek. Please note, that most of the lots in the empty version are not identical to the ones in the inhabited version. For instance, the Wilson's house; it's furnished in the inhabited version but not in the empty version. Meadow Creek is base game compatible and doesn't have any CC in it. We left some space for you to place more lots, for instance for EP lots (like dog park, or a nightclub,...). This is our 2nd neighborhood. At the moment, we're already working on the 3rd neighborhood called Bayside Flats. Look at this thread for more information. We always accept applications. To Numenor for his AnyGameStarter which we used to make this neighborhood base game compatible and empty. To Mootilda for her Lot Compressor which we used to compress all of the lots. To Peni Griffin for building Shop 'N' Stop, the three Starter houses and for creating the County family, along with their house. Look at the comments for more information about the family and the lots. Oh and of course for proofreading the descriptions. To HugeLunatic for building The Green Gnome and King's Clothier. Look at the comments for more information about the lots. To CatherineTCJD and CaliBrat for joining this group. 337 people have said thanks to Hood Building Group for this download.